I know smell isn’t perhaps the most important sense. I would certainly place my sight and hearing above smell. But, smell, is the most evocative sense to me. Like the opening bars of a song, a particular smell can instantly transport us back to a particular moment in time and make us feel a whole spectrum of emotions. I have lots of friends who wear many different perfumes – it is an extension of their style and look on a given day. I only ever wear one perfume at a time. And I have worn my current perfume for the last 20 years, Tiffany from the jewellery shop of the same name. I started wearing it when I was pregnant with my daughter and haven’t looked back. It is so intertwined with my own smell that I can’t smell it on me. But everyone comments on how “I smell like me”. I can’t really remember how I chose it – any perfumes I have worn and loved, I have instantly loved. I haven’t over thought it – but I do know there is a lot of subliminal pressure on that little bottle and its contents; I want it to make me feel feminine, beautiful, glamorous but most importantly reflect my character. Wearing the right perfume can make you feel like a million dollars. It is the finishing touch that stays with you all day – heralds your arrival and lingers in the air after you have gone. So I recently realised perfume was more important to me, than I thought… I realised this when I ran out. A month or so ago I was running low so I went onto the Tiffany website and my perfume was unavailable. So I thought I’d check back in a few days. Life is constantly busy so I forgot about it for a while and given there was enough in the bottle for a squirt or two, it was fine. But sooner than later I ran out. Anyway, I checked online, deciding I would spring for express delivery but it was still unavailable. Suddenly, a dreadful thought crossed my mind – what if it was discontinued??? So I picked up the phone and thankfully I was assured it was not discontinued, and they were expecting an order in about 3 weeks. 3 weeks??? That’s nearly a month. I asked the dude about availability in store and he said there was some – phew! So a few weeks ago, I went to every shop I could think of in London that would stock it – I covered a LOT of ground – It is amazing how focussed I can be, when I put my mind to it, but no luck. I even asked if I could buy the tester (! ), turns out you are not allowed to do that. As I walked back to my car from the store in Sloane Street, feeling dejected, I saw Jo Malone out of the corner of my eye like a beacon shining in the night and thought why not? I went in and announced I needed a new perfume. I sounded quite dramatic and panicked, mainly because I didn’t have much time on my meter, but heavens know what they thought. Anyway, they were lovely and after some time I walked out with Tuberose Angelica – and I liked it – but it wasn’t my smell. 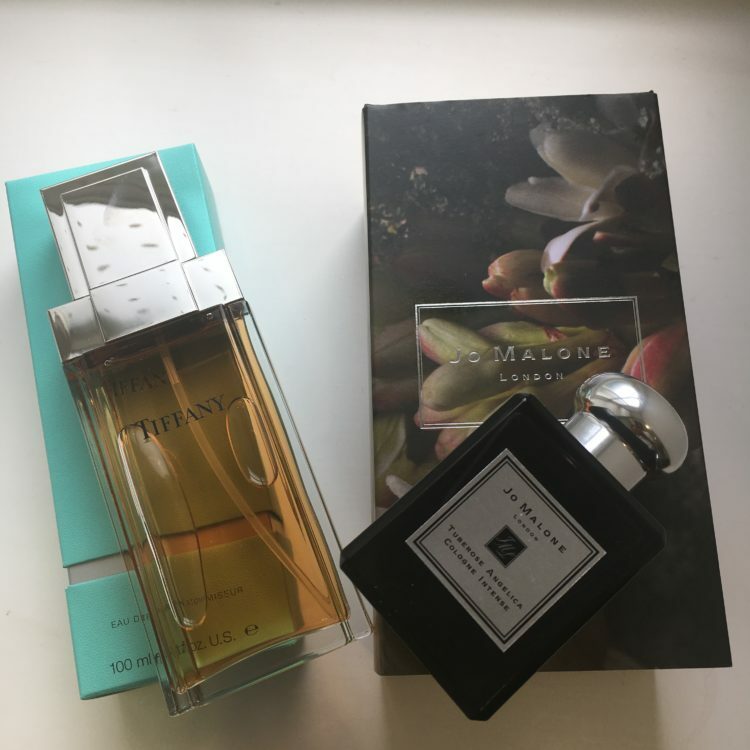 I felt hesitant but quite excited too – like I was cheating on my actual smell – I know that sounds ridiculous…. Anyway, the jury of friends and family were divided. One friend hated it, one loved it and my daughter was somewhere in the middle. I know this is trivial, but sometimes the trivial things do matter and I felt like my identity had been momentarily impaired. So what about you? What’s your favourite perfume? Are you a many fragrance or one perfume girl, or guy? How about chopping and changing scents – do you give it any thought at all?